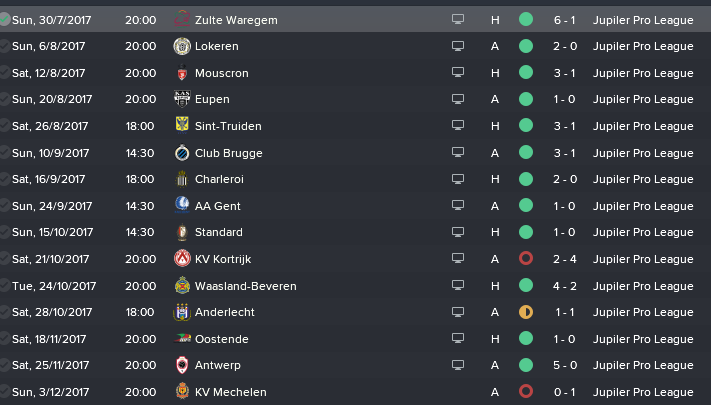 Welcome to Part Three of FMRookieGlenn’s maiden Football Manager series. This series follows young manager Glenn Toussaint as he enters the world of football management. In the previous post, Toussaint was appointed the manager of KRC Genk in Belgium and he gave his own review of the club and his goals moving forward. This post looks at how KRC Genk have performed in the first half of the 2017/18 season. So, you’ve met the manager and you know the club that will be managed by Glenn Toussaint, now it’s time for you all to meet the team. And to see how we started the season! When I came to the club for the first time as a manager, I started to learn more about my team and my players. It was very clear to me that KRC Genk has a well-balanced squad with many young talents. They only lack an experienced defensive-midfielder and a first choice right-winger. So this was what I was going to look for in the transfer window! Mariano Barbieri: The winger we needed! Barbieri has never left his home country so we’ve taken a gamble with him, but we are confident that he will live up to our expectations! Didier Digard: The experienced DM we were looking for. He will come in on a free transfer and will help guide the young players for one or two seasons! Of course there were also players who left the club. Bryan Heynen is a young midfielder who doesn’t quite fit in the system that I want to be playing and I don’t think he will live up to his potential. Luckily for us Swansea believes and was willing to pay 1.3m for him! Thomas Buffel was the club captain, but his wage was too high for a player who wouldn’t make it in the squad this year so we let him go on a free to Hull! Both Bojan Nastic and Holly Tshimanga went out on loan to try and get some game-time so they can maybe come back stronger next year! After all the transfer talk I can show you our preparation to the next season! We choose to play amateur teams so the players could adapt to our new tactic and build up some confidence for the new season! We had some good results, the most positive thing that we learnt was that we have a good defence but the attacking players need to work some more on finishing! Right before the start of the season, we played our gala match. This is the traditional fixture that compares us with a bigger side on the KRC Genk fan day! We lost to Atletico Madrid, but it was a close game we were unlucky in front of the goal! So now we can start our season! As you can see we had a very good first half of the season. We went 9 matches without losing a single point and in total we only lost 2 matches and drew once! As you’d expect we are top of the league. Now it’s up to us to keep going and to bring the title back to Genk! Next time I will talk you all through the second part of the season. Can we bring the title to Genk? And will we be competitive in the Croky Cup? Tune in next time! This entry was posted in FM18 Stories, Football Manager 2018, KRC Genk | @FMRookieGlenn and tagged belgian pro league, belgium, fm stories, fm18, fmrookieglenn, football manager, KRC Genk, KRC Genk | @FMRookieGlenn. Bookmark the permalink.